It seems like it is becoming a trend to begin my post with an apology of some sort for abandoning/not posting anything because it is obvious that I haven't been writing much and the periods between posts are getting longer and longer. Before I write about raya, I shall write a bit about Ramadhan. It was a blessed Ramadhan indeed. Alhamdulillah I managed to fast without much problems but I missed 2 days of fasting because I was down with fever, flu and cold. I was also on sick leave for a day. I guess it must have caused by the very hot and dry weather. Babycakes was also down with fever during puasa and I had to take an emergency leave to take care of her. It was challenging but we pulled through. I hardly visited the bazaar Ramadhan this year because first, the bazaar near my house isn't that interesting because most stalls have moved to a different location, which I didn't bother to go due to its bad traffic. Secondly, there wasn't anything much that I feel like eating or buying at the bazaar. Thirdly, I have a fear that the foods cooked and sold were not clean and unhygienic that it will cause tummy ache or diarrhea and being in my condition, it is not something I am willing to risk. I cook most of the days but I cooked very simple meals. Hubby isn't a fussy eater so I can cook simple dishes without worrying whether he will be satisfied or not. 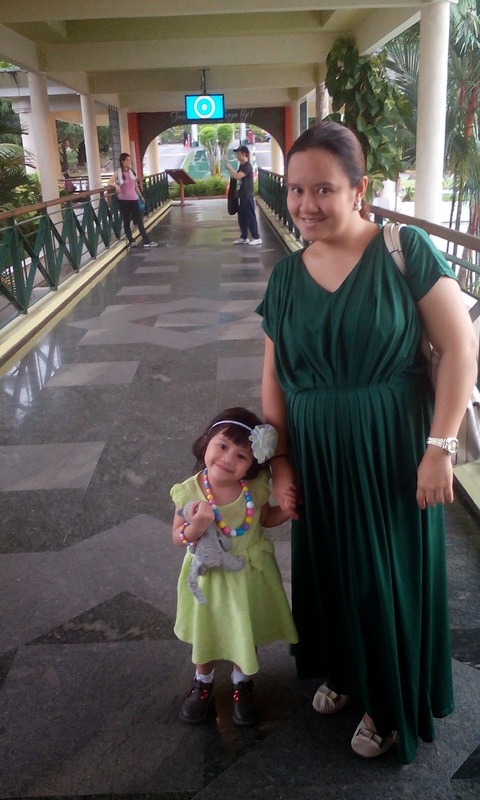 During Ramadhan, we were allowed to go back at 430pm so by 450pm, I already reached Babycakes' nursery. I would pick her up and I usually managed to nap for at least 45 minutes before I start going into the kitchen to prepared foods. I would tell Babycakes that I wanted to rest or sleep. Alhamdulillah she understood me and she would just play by my side or mind her own business until I woke up. 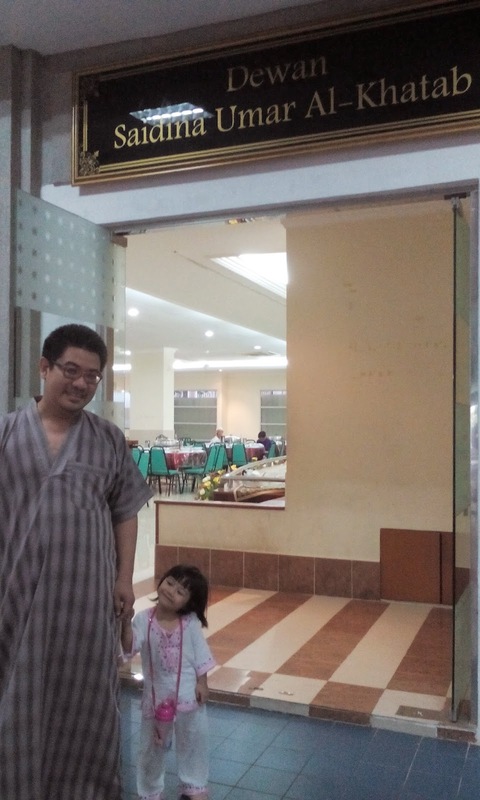 We also went for break fast at Masjid Saidina Umar Al-Khattab, Bukit Damansara on one fine evening. Hubby suggested the idea so why not? It's a new experience for us. 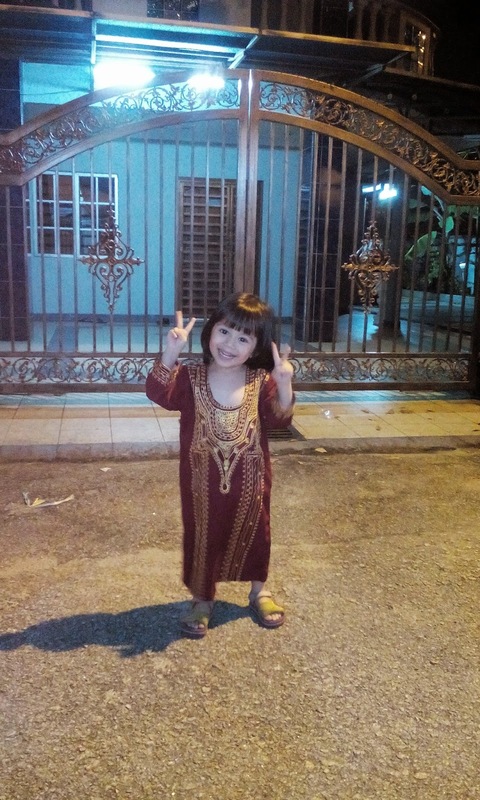 Babycakes was excited when we told her we are going to the masjid. The hall where we had our feast. For starters we had some kuih and then proceeded for Maghrib prayers. After prayers, we went down again and had rice with some dishes. May Allah bless those who contributed to the feast that evening. 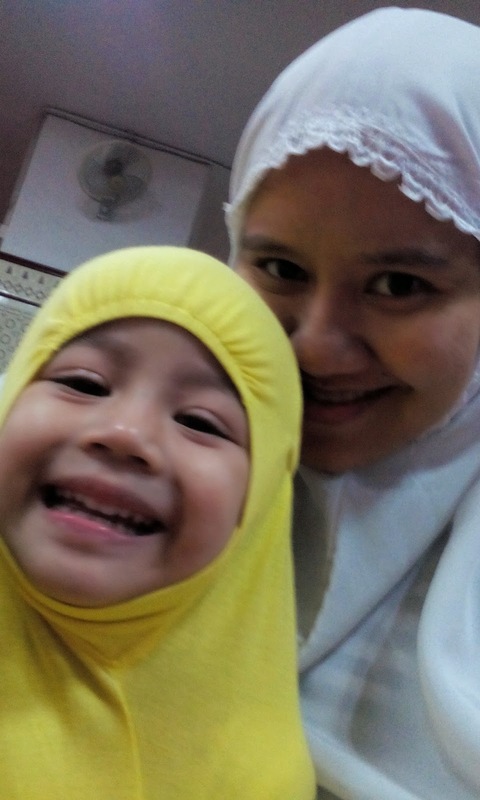 Here's a pic of me and my Babycakes, wearing her yellow telekung. The mosque was fitted with air conditioning so it was very comfortable and nice. 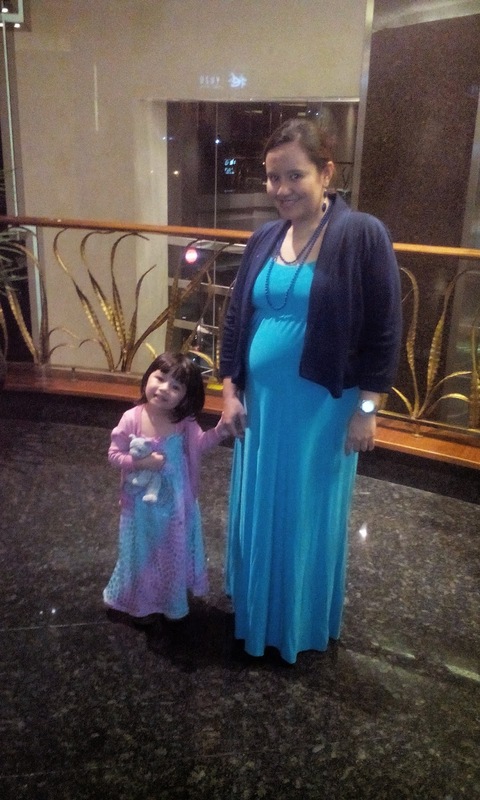 We also went for break fast outside several times and I tried to be all matchy-matchy with Babycakes. I mean, when else can I wear colour coordinated clothing with my girl, right? 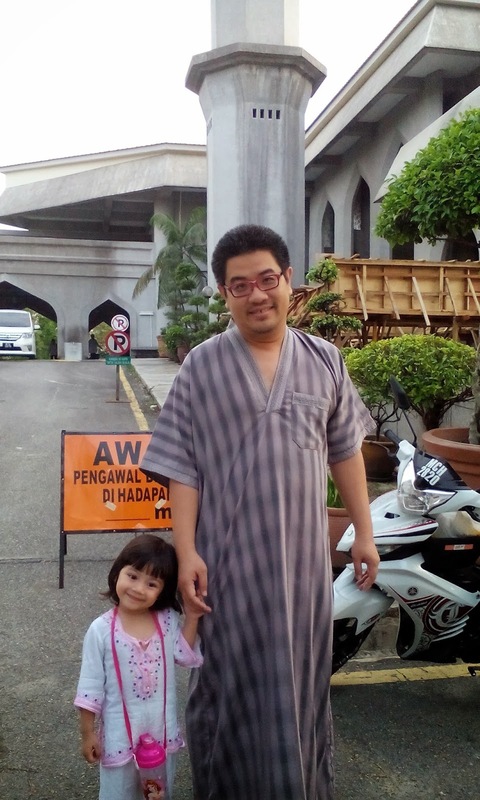 This picture was taken at Kelab Darul Ehsan where we had break fast organized by Hubby's office. 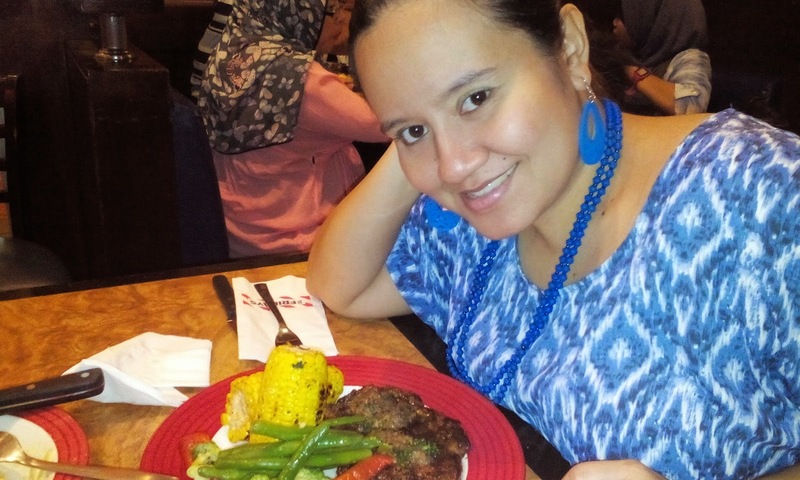 This was at TGIF, The Curve on one Saturday evening. Don't we look alike in this pose? Hehe. This picture was taken at Eastin Hotel where we had break fast organized by my office. The next day, Babycakes went down with fever. 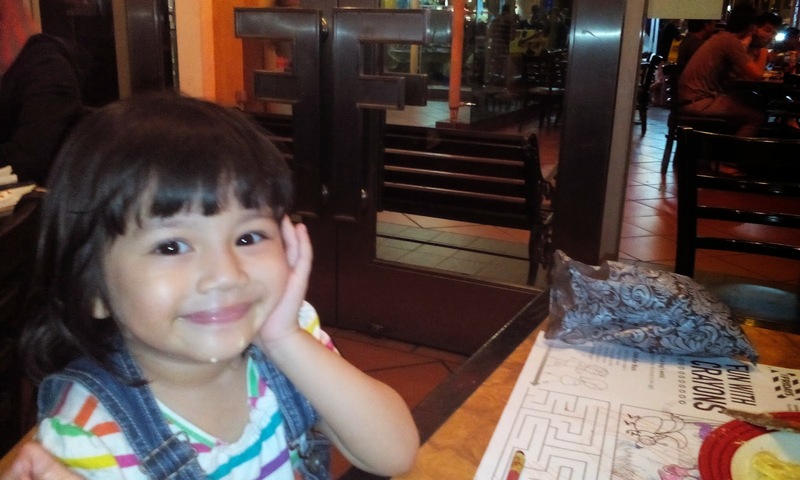 This picture was taken at Kota Damansara where we joined some orphanages for break fast, organized by Hubby's friend's company. We also went for break fast at several other places with my family including Royal Lake Club, Country Kitchen TTDI, Dewan Perdana Felda, sil's house and also at my brother's house. We also did some raya shopping here and there and only bought Hubby's baju melayu two days before raya. It was indeed a blessed Ramadhan and let us all pray that our deeds are accepted by Allah swt and may we all meet again next year, Insyaallah.